In an opinion recently issued by the New York Appellate Division, the court reversed a trial judge’s decision and permitted a lawsuit for a nursing home’s negligence to move forward to trial. The case, titled Petralia v. Glenhaven Health Care Org., centered on an 88-year-old woman suffering from dementia who had become a resident of the Glengariff Health Care Center in June of 2008. During the eight months that the woman was a resident of the facility, she had fallen from her bed eight times. In March of 2009, as a result of her eighth fall, the woman suffered a fracture of her femur. She was forced to undergo open reduction internal fixation surgery to repair the fracture. The woman filed a lawsuit against the care facility, but passed away in December of 2011 before the lawsuit was concluded. John Petralia, the woman’s son and the executor of her estate, stepped in to act as plaintiff on the woman’s behalf. The lawsuit asserted claims for medical malpractice and negligence resulting in the woman’s injuries. Petralia claimed in the suit that the care facility had been negligent in failing to comply with generally accepted safety practices in nursing homes. Specifically, he argued that the facility did not implement sufficient fall precautions, failed to properly restrain the woman, did not use bed rails to prevent such a fall, and did not respond in a timely manner to a bed alarm. The defendant filed a motion for summary judgment, seeking to have the claim dismissed. Representatives of the care facility presented testimony from an expert stating that the home had been following the fall prevention interventions included in the patient’s care plan when she fell. They argued that they had made every reasonable effort to prevent the fall which nevertheless occurred, and that despite plaintiff’s claims, restraints had not been warranted and nurses responded quickly to the bed alarm which sounded when she fell. The plaintiff responded to these arguments with testimony from his own expert. That expert presented evidence that bed rails, called for in the woman’s patient care plan, had not been raised when she fell. The expert also asserted that the facility had failed to implement backup fall prevention measures which, coupled with the failure to use bed rails, amounted to a violation of the professional standard of care. The trial court granted the defendant’s motion, dismissing the plaintiff’s complaint, and the plaintiff appealed. Where a dispute over the facts of a case still exist, courts should not grant motions for summary judgment but instead should permit claims to go to trial, allowing a jury or judge to make the ultimate decision on which party’s version of the facts seems more credible. The existence of disputed facts in this case resulted in the Appellate Division denying the motion for summary judgment and allowing the plaintiff to move forward with his claims against the care facility in court. 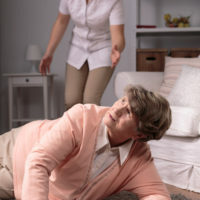 If you or someone you love has been injured in a New York nursing home or medical facility, find out if you may be entitled to money damages for your injuries by contacting the effective and determined New York personal injury attorney Leandros A. Vrionedes for a consultation on your case, with offices in Manhattan at 212-889-9362 and Queens at 718-777-5895.